My kiddos are so looking forward to the 100th Day of School! I don't usually make as big a deal out of it as other holidays, but it has to be celebrated at least a little! 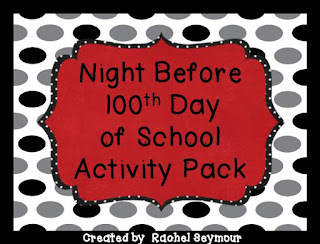 I created this quick little pack to go with Natasha Wing's The Night Before the 100th Day of School. Everything is ready to be printed. I have included a parent letter if you want your kiddos to bring in 100 items, a badge to wear, a class book to make, and an activity book to do. Click here or the picture to go to my TpT store and purchase it! 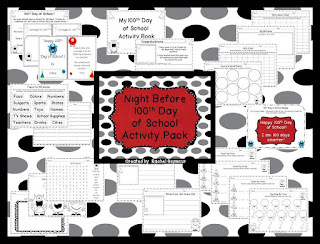 I will give this pack away to *three random people* who leave their email address and a comment about how you celebrate the 100th Day of School! Winners have already been chosen. See here. Make sure you follow my blog so you know when I'm giving away freebies! I always give away a few of my newest TpT packs for free when I'm done posting them!! We celebrate ALL day long! we write to 100, write 100 words, measure with 100 steps, and so much more! I love, love, love these Natasha Wing books (and your accompanying packets)! We make hats and t-shirts to celebrate the 100th day! Love your units! We have the kids see how many jumps the can jump with rope in 100 seconds! We have a Math Marathon to solve 100 math problems. Some are easy and some are difficult! Each time a problem is solved, we ring a bell. It's high drama, wondering if we will make it!!! A 100 piece snack is always the hit! Cute packet! I have the kids decorate a shirt with 100 things, and we hold a museum for each table group to walk through. We celebrate by reading books about the 100th day, bringing 100 items from home (which we weigh; measure length of; sort into groups of 5's, 10's, 20's and 25's; compare with other groups of 100, etc), have a 100th day snack, bring a poster from home that was made with 100 items, read 100 words, write 100 words (groups of 4-each write 25 words for a particular word family), do things for 100 seconds (like jumping, being quiet, writing name, etc), and much more. Cute pack. I love reading that book for the 100th day. We also play race to 100, do different excercises 100 times and make a cute 100s hat with stamps. It looks great! So glad you like the fonts! We have the kids dress up to show what they think they will look like at 100. It's fun and they look so cute! We celebrate all day with books about 100, writing and art of what we would look like at 100. So excited for the 100th day. 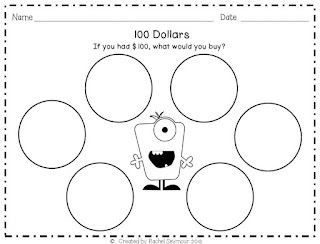 I am new to first grade so I'm gathering ideas for the 100th day in my class. I teach in a small school house in west Africa, and this is my first year teaching elementary (started in junior high). 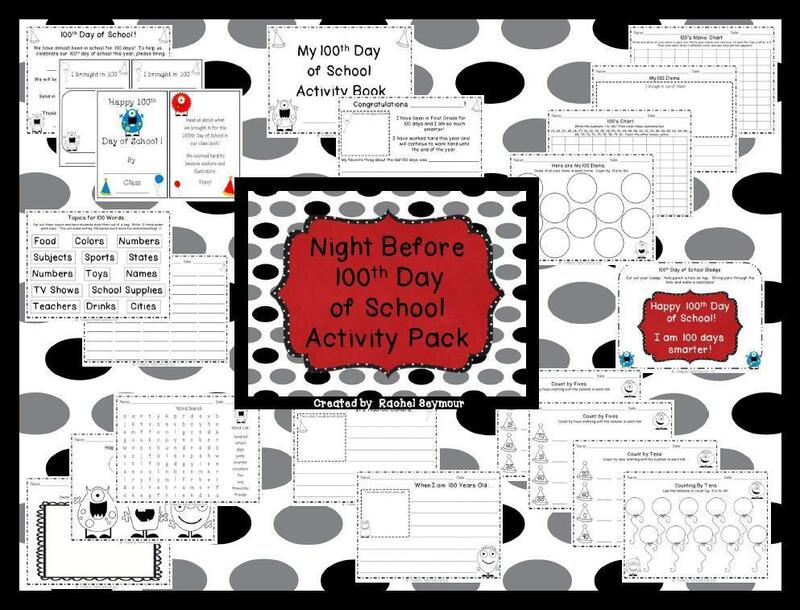 I am so excited to plan a day of 100 day activities! We'll definitely do an estimation station, figuring out how far we can get in 100 steps, how much is 100 tablespoons, 100 cups, etc. in different containers. My students are all different levels, so differentiation is key! Thanks for creating this great pack! We tried to make a chart of 100 ways to make 100...got challenging at the end! Also did other 100 activities like writing a story with exactly 100 words, etc. We do rotations to the other teachers in K classrooms and do different activities. I hope I am not too late! We write about what we will be like when we're 100 years old (what we look like and do and what we hope to accomplish by then.) Each student also gets die cuts that say 100. They turn the numbers into a some sort of picture creation. We make a list of things we would like to have 100 of and then a list of things we would not want 100 of. Students pick one thing they do/don't want 100 of and write a creative story. Oh they also make a craft of themselves at 100 years old. Make the face out of paper. We use cotton for white hair, and I have fabric, buttons,and beads for them to use as a shirt and accessories. They turn out so adorable!